You are currently browsing the category archive for the ‘Hello!’ category. 2 things will be happening this week – firstly, we are switching internet providers (I am sure everyone knows what a pain in the backside that can be!!) – this is due to happen on Wednesday, we have been assured that we will still have the internet up until Saturday … fingers crossed this is true! I am sure the internet will switch over smoothly, and that there will be no interruption … however, as it can supposedly take up to 14 days to switch over, I thought it was worth mentioning just in case! Secondly, we are headed off on our Easter break next week, therefore, the last day for shipping orders will be THIS FRIDAY, April 8th. You can of course still place orders during this time but please note, no emails will be answered and all orders placed after April 8th will not be processed and shipped until MONDAY APRIL 18th. The new website is now LIVE!! BlytheCon UK – are you going? I am extremely excited (and nervous!!) about BlytheCon UK which is happening THIS weekend, Oct 2nd! My daughter and I will be driving up on the day so I won’t be having a stall (this year!) however, that hasn’t stopped My Little Customs from donating a prize; here is a sneaky peek at the goodies! 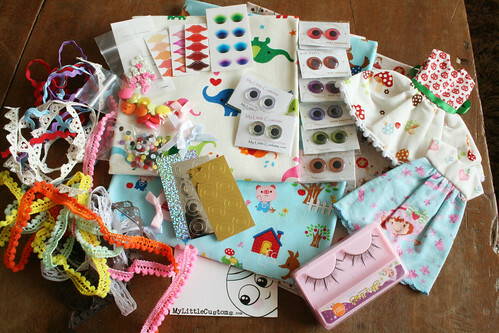 A http://www.mylittlecustoms.com Gift Certificate, 6 pairs of Pupa Paradise eyechips, 1 pair of natural iris eyechips, 1 pair of origami paper backed eyechips, 3 fat quarters of super cute fabric, 2 cute handmade Blythe dresses, 1 set of Blythe eyelashes, 3 sets of eye foils, 3 sets of lipstickers, a lip painting template, a set of graduated foils, lots of tiny 4mm buttons, pink and white heart buttons, apple shank buttons, little bows, pom pom trim, rick rack trim and various lace trims! Last week was completely crazy but I am now back in the land of the living and sorting through everything I missed last week – please bear with me whilst I catch up! Just quick update to let you know that all orders received this week have been fully processed and sent out – please bear in mind that there may be a slight delay in some areas due to the snow and also Royal Mail! Thank you for your patience and understanding during this wintery time! No doubt there are hundreds of Blog posts out there in the blogging world about this but I was staggered to see the sheer number of hits my blog had received today! I wonder how many dolly fans are out there? Are you new to me or am I new to you? It is quite amazing! A big hello to you all!! Welcome to My Little Customs new blog! I will still occasionally update my LiveJournal however, I have become more increasingly frustrated with how long LJ takes to load hence my move. Please bear with me whilst I learn these new ropes!